ETTSI Incentive Premiums, a leading provider of travel certificates, sales incentives, and employee rewards, today announced the addition of the $300 cash back certificates to their assortment of sales incentive products. What’s unique about this incentive is that there are no activation fees or forms to mail before the customer enjoys a benefit from the program. 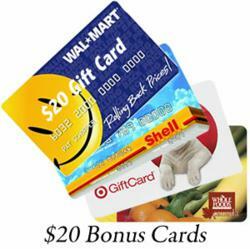 The $20 Bonus Gift Card gives them an immediate reward. $300 Cash Back Certificates offer the recipient the opportunity to receive up to $300 in rebates on purchases they make at specific retailers for products such as groceries, gas, and other goods that consumers frequently purchase. As an added bonus, the certificate comes with a $20 gift card that they can use immediately at the retailer designated on the certificate. Cash Back Certificates are designed for use as a sales incentive for medium to large ticket purchases at furniture & appliance stores, home improvement contractors, and automobile dealers. The purchaser of the certificate selects which retailer they feel will be best for their customer base and then gives them out with a qualifying purchase. Currently Wal-Mart, Shell Gas, Whole Foods, and Target are available with other retailers soon to be added. Some businesses purchase certificates for 2 or more retailers and let their customers choose which one they think is best. For detailed information about $300 Cash Back Certificates as well as ETTSI’s broad range of other incentive premiums products, you may visit http://www.ettsi.com or contact Frank Bertalli at PR(at)ETTSI(dot)com or call 1-866-224-9650.